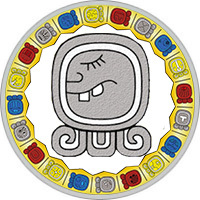 Mayan Name: KEME / Cimi. Compatibility: Death, Dog, Jaguar, Flint, Wind. The sign of Death (Cimi) is an inner strength, harmony. The meaning of the sign is the Wanderer between the worlds, the patron is the God of death Ahpuh, the symbol is the Skull. The ancient Maya believed that death is a process of rebirth, moving to the next, higher stage of development. Therefore, the moment of transition to another world, full of tranquility and harmony, can not be perceived as a negative event. Being born on the day of Cimi is a great success, you can treat it as a sign of inner certainty, harmony, wisdom. The people of Death sign demonstrate calmness and endurance in any circumstances. They try not to show aggression and stubbornness, their hobby is courteous manners and a huge amount of patience. The man of this day is a born diplomat, easily finding language with different people. Wisdom, discernment, restraint are qualities that allow solving the most protracted conflicts. The people of the sign of Death who are strong willedly slowly walk along the road of life towards their intended goals. Generously share their knowledge with others, magnanimously forgive lies and deceit. Clearly follow their destination — to bring peace and good to people. A sensitive, wise leader, skilfully leading the team to victories and achievements — this is the man of the sign of Death. There is no doubt that with perseverance and zeal, he will work in the smallest position, but nature can not be deceived: he is the leader. He makes great efforts to achieve success, but acts honestly. It works with full force, therefore it is considered as the held person. People of Death sign carefully listen to inner feelings, try to expand the boundaries of their consciousness, show interest in philosophy and occult sciences. With due attention to natural abilities over time, they manifest themselves as powerful astrologers. In love relationships, the people of the sign of Death are the true partners. They strive for long, lasting relationships, they do not seek for momentary pleasures. They try not to press on the chosen one, they are not forced to act against their will. Tactful, attentive representative of this sign is sometimes too overbearing, but he is moved by the desire to save a loved one from troubles and troubles. Undoubtedly, deserves happiness, but sometimes love brings suffering. Cardiac failures deprive vitality, for a long time immerse in woeful reflections. Only natural wisdom and discretion can lead him out of this state. Possessing the manners of a gentle man, Death can easily win people’s trust. It seems to be a soft and harmless person, but behind the external calmness there is a steel will. Acts tactfully, but firmly follows the intended goals, and therefore achieves success in the chosen field. Usually occupies managerial positions, lives in prosperity, does not feel need and deprivation. A woman can be sure of his honesty and decency. The man of the sign Death is a wonderful family man: a devoted husband and a loving father. The woman of the sign Death is full of contradictions, its cheerful and sociable character should not be misleading. Even small problems perceive as the greatest disaster in his life. A smart, discerning woman can not cope with internal fears, so depression is her faithful companion. He is cautious about perceiving changes, striving for a calm, measured life. But increased anxiety is just a sign of her strong intuition, a natural gift to see hidden from prying eyes. In the hands of a faithful, loving partner, he forgets about gloomy thoughts, shows his best qualities: softness, tenderness, sincerity.